This is a review of a dietary supplement known as Vital Memory. The manufacturer claims that Vital Memory offers support to the brain ensuring that the brain functions in a healthy manner. This product supports cognitive functions by maintaining memory, maintaining focus, and improving absent-mindedness. Read on to learn more about this product including ingredients, dosage, side effects, price, and guarantee. Acetyl L-Carnitine- Helps in maintaining cognitive function and the ability to concentrate. Vitamin B12 – Plays a significant role in maintaining nerves in the central system. Alpha Lipoic Acid- Fights dangerous natural substances called free radicals. Vitamins E- Prevents the body and the brain from harmful substances that might cause damages. Vitamin C – Fulfills the same purposes as vitamin E.
Folic Acid- Accomplishes the same purposes as vitamin C and vitamin E.
A pack of Vital Memory contains 45 tablets. The users of this product are advised to take one tablet one to three times in a day. It is recommended that users should take the tablets during meals or according to the directions of health care practitioners. Persons experiencing the problems linked to mild memory because of aging should take three tablets in a day in order to take full advantage of the positive effects of this product. You will pay $38.54 for a pack of 45 tablets of Vital Memory if you purchase it from the company’s website. This is a reasonable price compared to the price of similar products. The same pack costs $25.37 on Amazon.com meaning that consumers can get the product at a discounted price. After a keen analysis of the product, there is no indication of a money-back guarantee in case consumers are not satisfied with the product. This deficiency is likely to cause quality concerns. Nevertheless, based on the customer reviews on Amazon.com, Vital Memory seems to be a satisfactory product for those who have used the product so far. Most of the users have given ratings of 4 out of 5 followed by users who have given ratings of 5 out of 5. These ratings show that Vital Memory satisfies the needs of consumers. 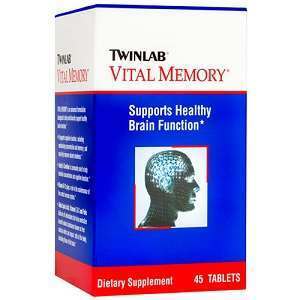 Vital Memory is an appropriate dietary supplement for people who want to maintain a healthy brain and improve their memory, concentration, and absent-mindedness. One of the benefits associated with Vital Memory is that the product is a combination of many well-known ingredients proven by research to aid brain functions. Moreover, most of the consumers who have expressed their experiences with the product through product reviews are satisfied with the product. Therefore, potential customers are likely to trust and purchase this product based on these reviews. This product also comes from a GMP registered manufacturer. Therefore, it is relatively easy for users to trust Vital Memory. It is somewhat concerning that there is no information about the possible side effects. Moreover, new users may worry about the lack of a money-back guarantee. Henry Costa	reviewed Twinlab Vital Memory	on June 14th	 and gave it a rating of 3.